Experience the charm and timelessness of a log cabin. "Before him was the belt of timber, and beyond, the dark mass of mountain ridge with the low gap where his home nestled among the trees. He could see the light from the cabin window shining like a star." When it comes to building your dream home, you need an experienced builder who understands the entire log cabin, construction process—from milling and planing the perfect log cabin logs to placing each one with care and precision. 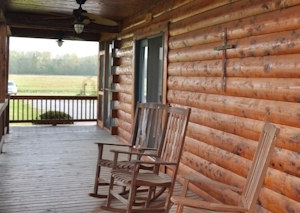 Located in North Central Arkansas, in the heart of the Arkansas Ozark Mountains, Red River Log Cabins has the expertise in milling quality cedar materials and a builder of custom designs to accentuate your own natural style. In addition to being a builder of log cabins, we mill log home construction materials, allowing us to provide any builder with low-cost construction supplies. Our product lines include all standard sizes of milled lumber as well as custom pieces for any home construction project. For a quote, give us a call today at (870)251-1314.